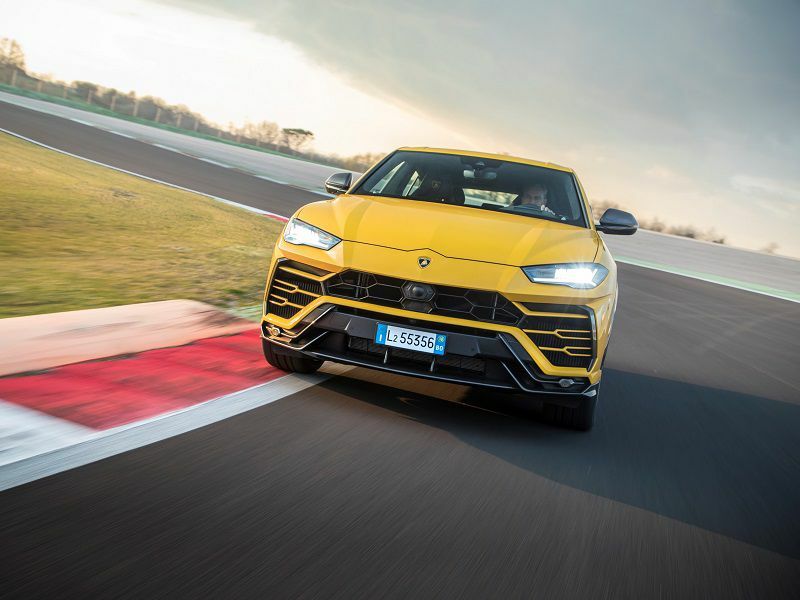 The 2019 Lamborghini Urus is an SUV from a company that usually makes low-slung, high-speed, two-seat supercars. 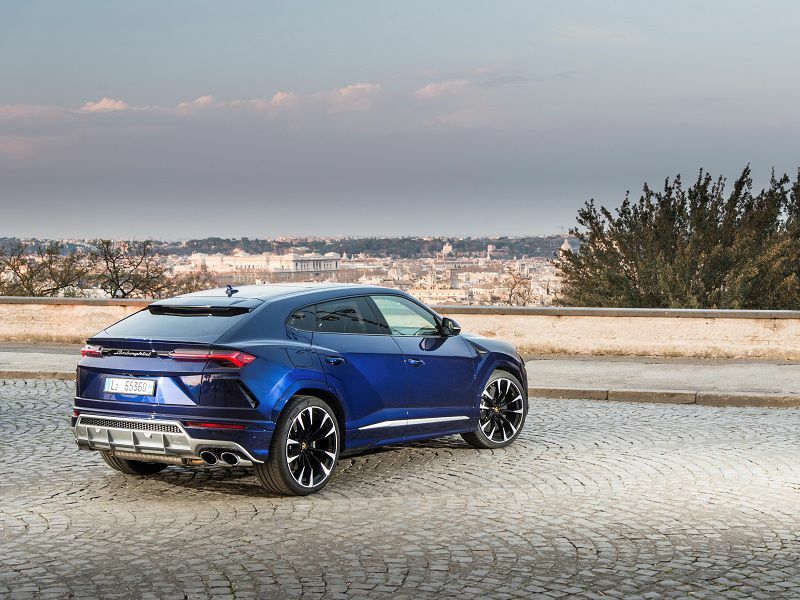 It might seem like just the latest of many enthusiast car makers jumping on the bandwagon and cashing in on the apparently insatiable demand for SUVs and crossovers, but whatever the initial motivation, Lamborghini designed and developed the Urus to be like no other SUV. Just like its cars are like no other cars. 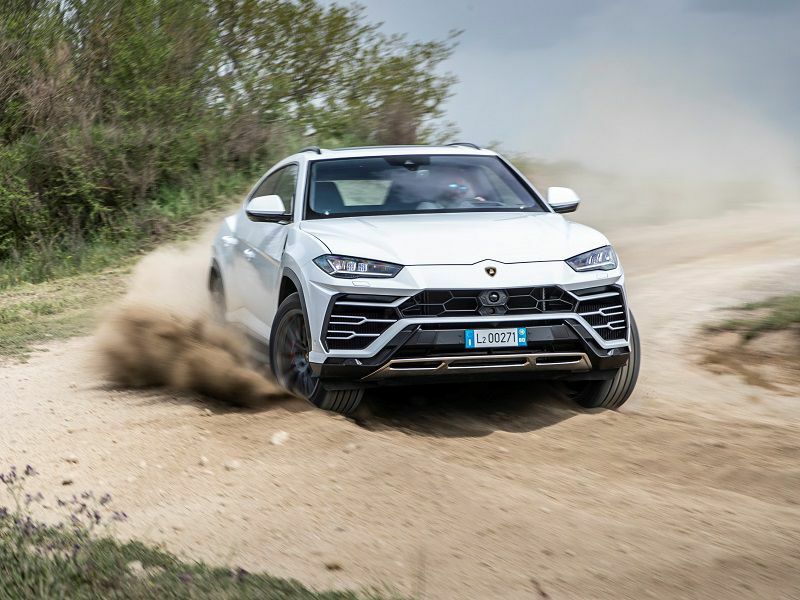 Where the Urus is similar to other crossovers and not any other Lamborghini is that it’s civilized, refined, and can be driven every day in virtually any situation. Cynics may dismiss the Urus, but until they’re behind the wheel, they’ll never know the full story. The 2019 Lamborghini Urus starts at $200,000. That sounds like a lot of money. Heck, it is a lot of money. But some things need to be taken into account. First, the amount of standard equipment is generous and wide-ranging, including carbon ceramic brakes (quite often an expensive option in other cars). 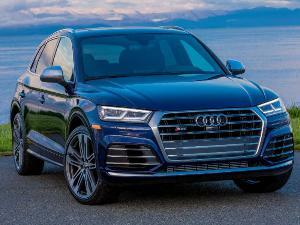 And in this rarefied air of top-class SUV/crossovers, the Urus is priced similarly to the entry-level Bentley Bentayga, while around $125,000 less expensive than a Rolls-Royce Cullinan. Closer competition comes from within Lamborghini’s stable (the VW/Audi group): the Porsche Cayenne Turbo S, from around $164,000. 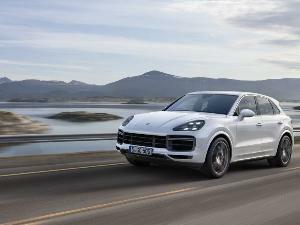 But it “only” has 570 horsepower and isn’t exclusive enough, since it looks like the rest of the Cayenne range. Some ingredients for an SUV from Lamborghini simply have to be included, like all-wheel drive and a muscular engine. 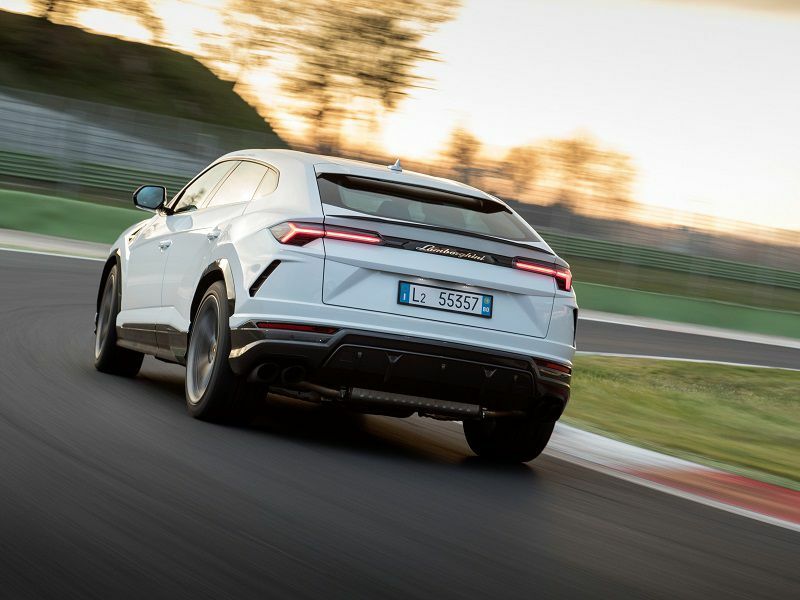 But the Urus goes way beyond that to include the aforementioned fade-resistant carbon ceramic brake discs, adaptive air suspension, rear-wheel steering (for optimum agility), torque vectoring (for stable yet rapid cornering), driving modes ranging from snow to race track, leather upholstery, heated 12-way power-adjustable front seats, smartphone integration, a configurable driver information display, 21-inch alloy wheels, and a powered tailgate. Oh, and the exhaust system in the new Urus has the ability to gurgle, growl, bark, and howl. The company’s two-seaters sound wilder, but for a bit of everyday spine-tingling, this one delivers. The standard seating arrangement is for five occupants, although the Urus offers the alternative of four bucket seats. We prefer the greater lateral support from these sport seats, especially when taking fast corners. 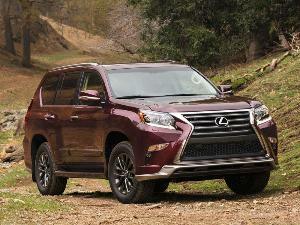 An off-road package brings drive mode settings for sand and dirt, plus extra underbody protection. Wheel sizes run to 23 inches. 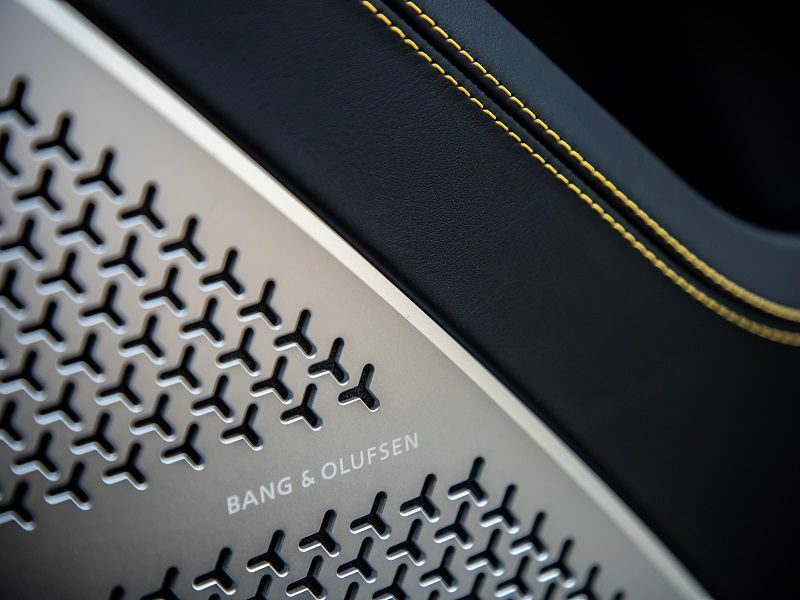 And even though the Urus makes its own kind of music, buyers might like to consider the 21-speaker, 1,700-watt Bang & Olufsen “3D” sound system. Other options include a head-up display, hands-free tailgate operation, a rear entertainment setup, a 360-degree camera system, 18-way power-adjustable front seats with ventilation and massage functions, and wood trim. At the bottom of the center console is a set of controls arranged into an inverted T. This the Tamburo (drum). It’s dominated by a red flip-up cover under which is the ignition button. On the left side is a lever marked Anima, where the driver can sequence through drive modes from Strada (road) to Neve (snow). Doing so changes the responses of the throttle, transmission, steering, and suspension to suit each situation. Corsa is the track setting that loosens the grip held by the traction and stability systems, allowing the driver to slide the tail and apply corrections before the electronics activate their virtual safety net. The lever on the right side (marked Ego) is for user-defined settings. A twin-turbocharged 4.0-liter V8 propels the Urus with a mighty 641 horsepower and 627 lb-ft of torque. The accepted wisdom is that 500 hp is perfectly acceptable for anyone not seeking to leave the Earth’s gravity, but the Urus wouldn’t be a true Lamborghini if its power levels were only perfectly acceptable. 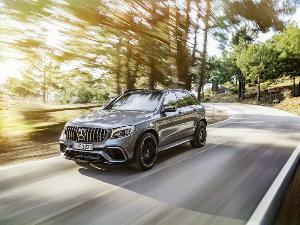 This energy goes to all four wheels through an eight-speed automatic transmission, and the driver can get more involved by using the steering wheel-mounted paddle shifters. One (of many) cool features is that to get out of neutral and into Drive entails clicking the right paddle, similar to a Formula One racer. 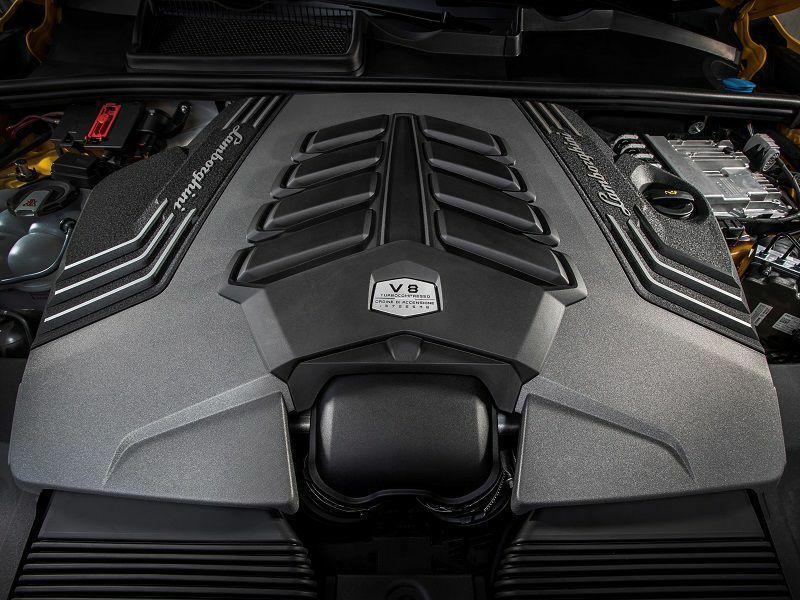 A Urus buyer probably doesn’t care about fuel economy, but this V8 does include cylinder deactivation. No, we haven’t confused these figures for a sports machine. 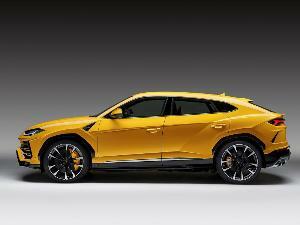 The Urus can sprint from standstill to 60 mph in a mere 3.6 seconds, before hitting a top speed of 189.5 mph. This is commonly known as “ridiculously fast” despite a hefty curb weight of 4,843.5 pounds — even though the company uses several ingenious weight-saving measures in this vehicle’s construction. Its power-to-weight ratio, however, is class-leading at one horsepower per 7.45 pounds. At the other end of this performance envelope are huge carbon ceramic discs: 17.3 inches in the front and 14.6 inches in back. They’re the biggest discs on any production vehicle and provide phenomenal stopping power, yet they’re still perfectly usable on public roads. The action is confident rather than grabby. 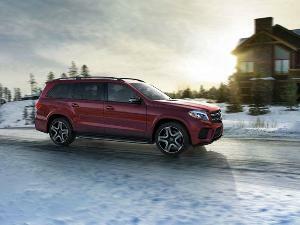 Rear-wheel drive vehicles tend to feel more sporty than those with front-wheel drive. It’s physics. To simulate, or at least get close to that feel, some all-wheel drive vehicles can send most of their power to the rear wheels. The Urus has a default 40/60 front-to-back setup, with up to 87 percent sent rearward when conditions demand. Alternatively, 70 percent can be directed up front if necessary. The adaptive air suspension raises or lowers, and softens or stiffens, in sync with the drive mode selection. On the road, it’s comfortable and controlled. On the track, precise and nimble. It can be all those things off-road, thanks to active anti-roll bars and active wheel decoupling to keep all wheels on the ground. 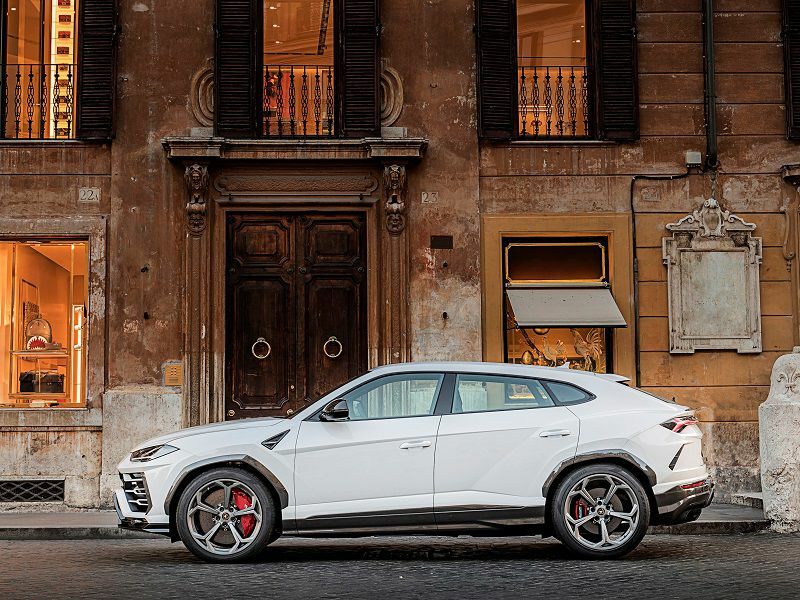 The new Urus is based on the same platform as the Porsche Cayenne and Audi Q7, yet this is still the product of an Italian company. And the Italians don’t go in for cooly cerebral, but rather prefer a seductive mix of style and passion. 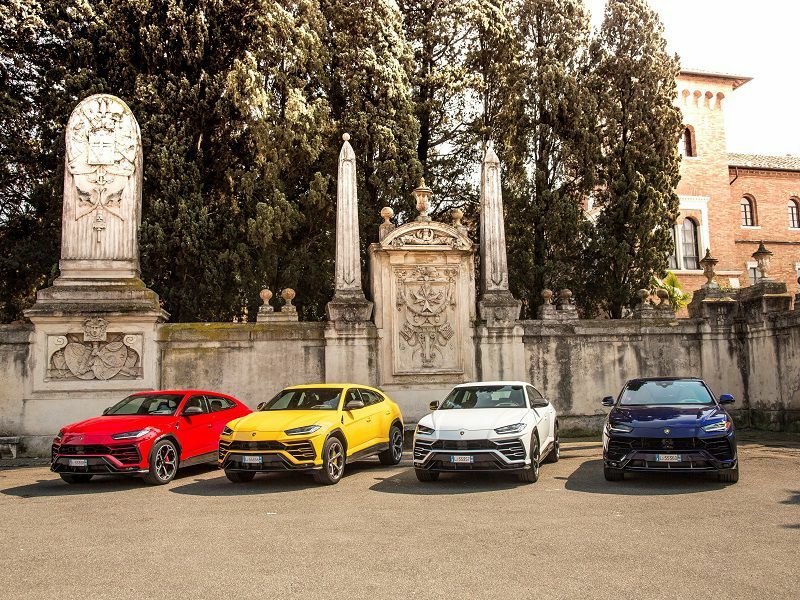 Look at the profiles of Lamborghini supercars and there’s a certain relationship between the rear pillars and the back wheels that is echoed in the Urus. While other SUV/crossovers are boxy, this one has some attitude and sleekness. The short overhangs perform a dual function of accentuating the vehicle’s driving abilities as well as being a useful characteristic over uneven terrain. Once the driver gets past the disconnect of looking at what appears to be the dashboard of a supercar, but from the perspective of a raised driving position, there’s a lot more to appreciate. From the leather upholstery to the touches of aluminum and carbon fiber, all the materials are high-quality and assembled to the appropriate standard. This is also the roomiest Lamborghini there’s ever been, with plenty of space up front, accommodation for 6-foot passengers in the rear, plus 21.8 cubic feet of luggage space that expands to 56.4 cubes when the rear seats are folded. And it’s easy to get in and out of the Urus, which isn’t something that could be said of any other Lamborghinis. Lamborghini has established a separate facility on its grounds in northern Italy dedicated to building the Urus. The company expects the majority of buyers to be new to the marque. They’re in for a treat. We’re glad Lamborghini exists, and that it makes fast and exotic supercars with bold styling. If the Urus allows it to continue on that path, then there’s one more reason to like it. 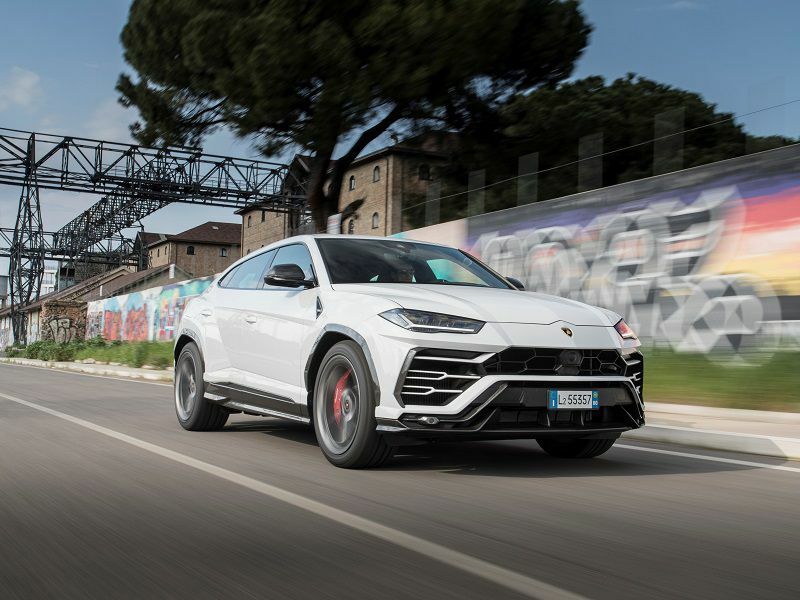 Even so, the new Urus is a special animal, capable of functioning well in such disparate worlds as the race track and the forest track, yet still ideal even if it never strays from public highways. It’s a fast and exotic super sport utility vehicle with bold styling. 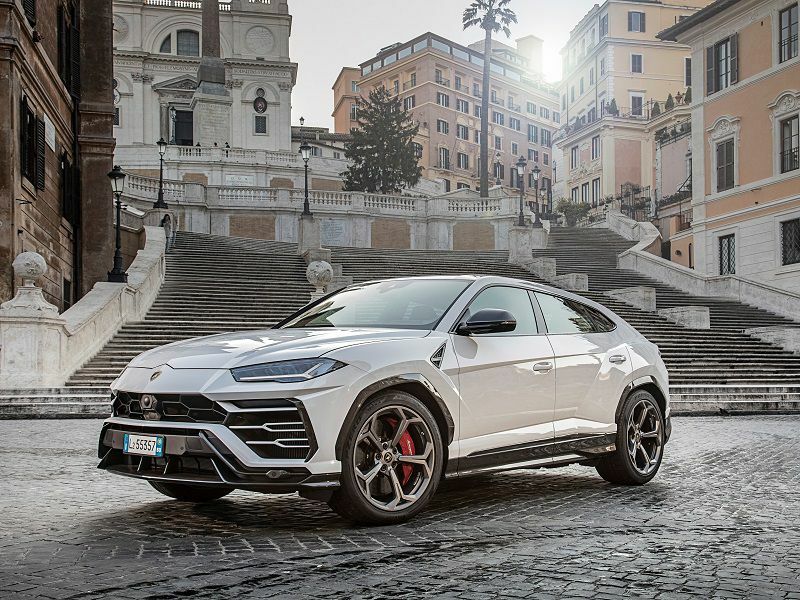 The 2019 Lamborghini Urus is available now.